I’ve been a bit slack on the posting over the last little while, which is not a great way to start off 2012! Artistically I’ve been feeling a bit stale as well, with no classes in sight and no solid goals to work towards. I’ve decided that this just won’t do. The last time I was stuck on a painting and wanted to finish it, I made a list of all the things left to do to get it into a “finished” state. After completing the list, not only did the painting look great, but I felt accomplished. The piece in question is the textbook still life I did a while ago for Tim. 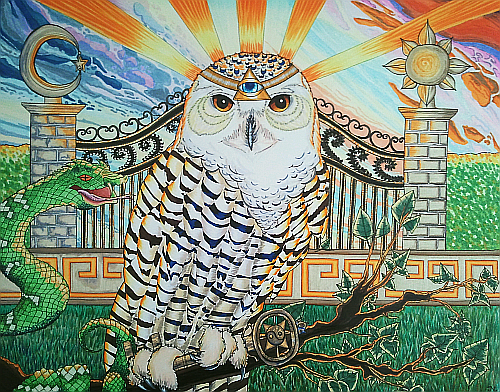 It made sense to get a list going of steps left to complete since there were so many details in the painting itself that it was easy to get lost. I used this strategy on my abstract self-portrait and it worked just as well. 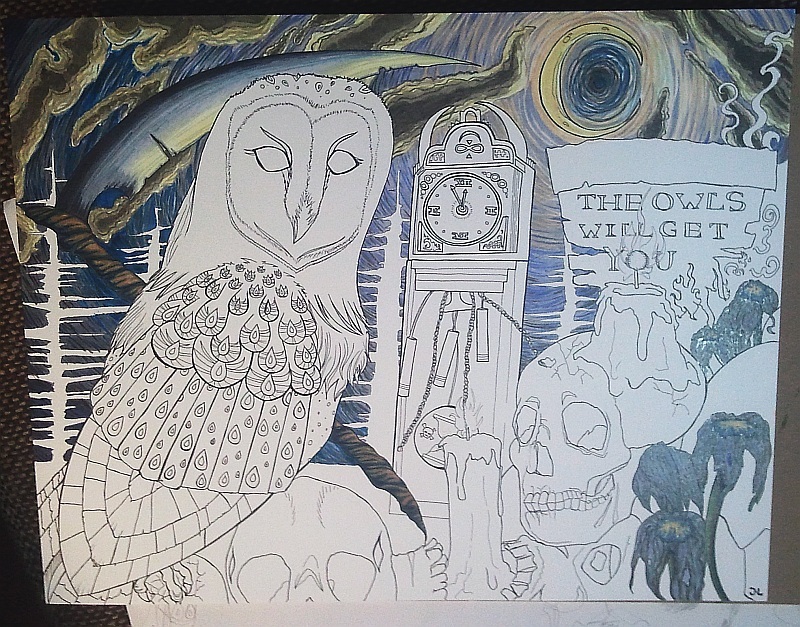 When coming up with a to do list of what I’m currently engrossed in, I decided that my Life Owl drawing is not finished. After consulting with Tim (he has a completely different and refreshing perspective on things), we decided parts of it need more shading so that the work as a whole is more dynamic. The other piece that’s been on my mind for awhile has been the abstract. You can tell that I’m feeling weird about it since it doesn’t even have a proper name yet. I haven’t been able to make up my mind about where to take it next and I think that’s because I’ve been going about it the wrong way. I’ve been looking at it in terms of what’s already there and how to make pieces come forward and push others back. While looking through my pinterest boards for abstract art inspiration, I came across a bunch of wallpaper patterns that have been attracting my attention and then it came to me: what I currently have looks like a background, so why don’t I add some kind of pattern to the foreground? I’m going to add a pattern of cherry blossoms on top of it, some transparent and some opaque. I’m armed with a list and ready to paint, so let’s hope I can finally cover some ground on this! 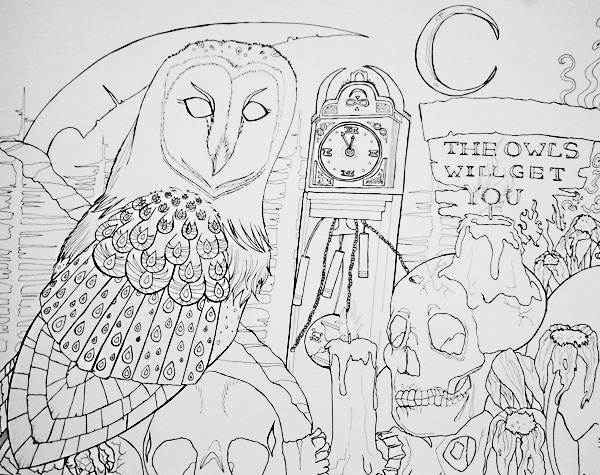 The third owl image is now inked! I’m a little surprised that I didn’t empty out any of my pens on these drawings, given all the detail I put in. I plan to look at the three as a whole and make sure the styling is consistent (line widths and such). Having done a few copic illustrations, I’ve started adjusting the way I ink to better suit the medium. For example, with copics, coloring a large area evenly is difficult since the medium dries so fast and can streak, so I tried to fill empty space as much as possible to correct for this (the exception being the sky where I plan to do some color-blending). Now the fun begins… swatching some copics in my sketchbook! I began another project last Thursday, this one completely different than what I’ve been doing. There’s a lot of empty wall space in our bedroom and I’ve been meaning to paint another abstract, so I decided to kill two birds with one stone and paint something for our room. I wanted to really get away from what I’ve been doing, the researching and planning and measuring out etc etc. With this I put on some music and just went for it, only having a color palette in mind. It’s already changed a lot from where I started (LOTS of water). I started by painting on the floor so the water wouldn’t run off, which as it turns out, is really hard on my back. 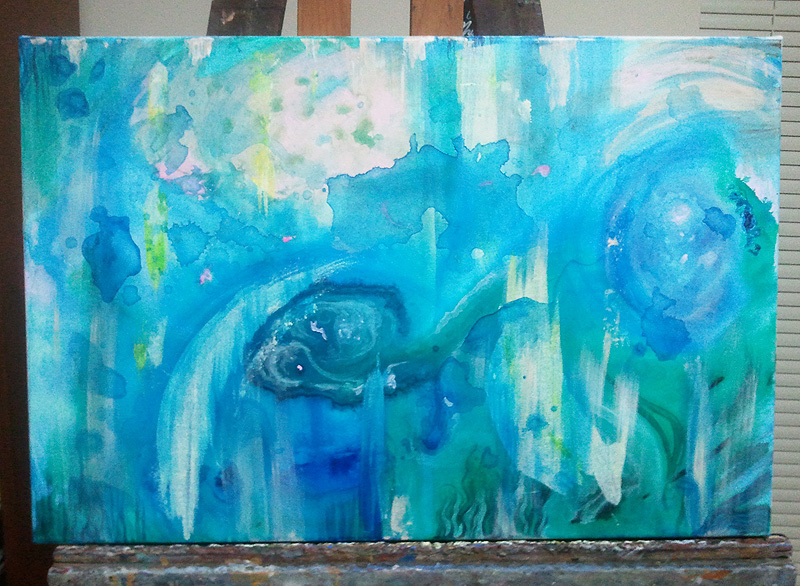 Thankfully it’s dry now and I’m pretty well done putting large amounts of water on it, so I’ve got it up on an easel. 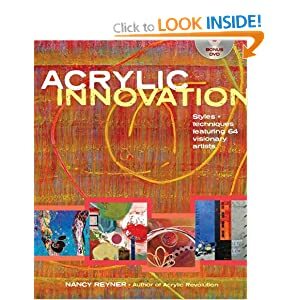 I had a choice between two other books on acrylics but chose this one because it covers so many different styles and interviews many different artists. The other books were mainly just a list of different techniques with no context. No word of a lie, I’ve been reading this book all weekend and love every page! I’ve already learned so much about abstraction using acrylics and I’m super impressed with the material and artists involved. Most of the hyper-realism I’ve seen has been by oil painters, but there are a handful of artists interviewed in this book that really know how to push acrylics. I highly recommend it! 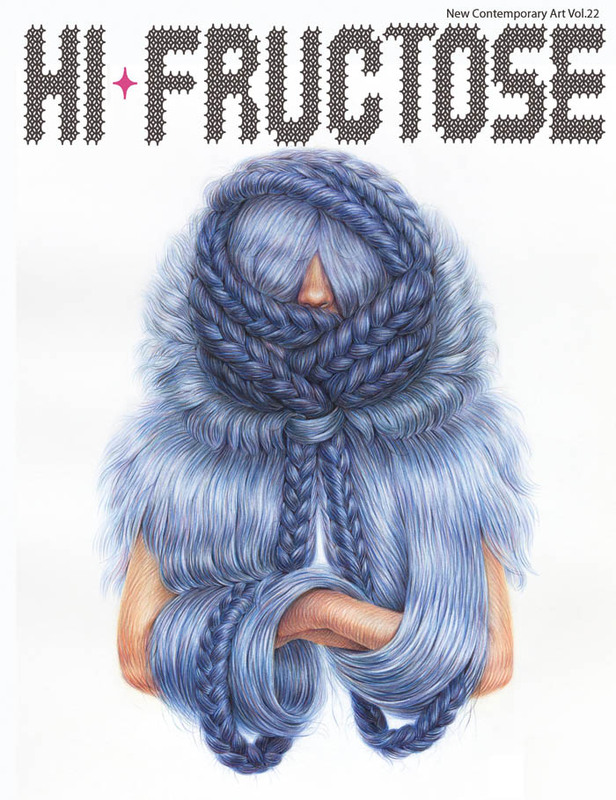 Hi Fructose issue 22, pick it up if you get a chance! It contains a 12-page spread interviewing Natalia. Great magazine, great price and the only ads are other artists advertising their shows.